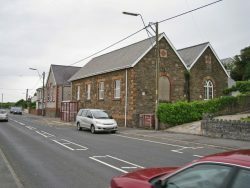 The Pwll Education Centre on Pwll Road has been used as a school for excluded Children for some years. It has now been declared surplus to requirements by Carmarthenshire County Council and the Pwll community are keen to retain the building as a Community Centre once more. The most recent meeting was held on 4 July, 2017. 504 petition signatures had been collected up to this point (456 door to door, 48 online). The next meeting will be scheduled for December, the date and venue is to be confirmed. To visit the Facebook page recently set up, click here. There was an encouraging turnout from the local community at last night’s (30th November) Public Meeting regarding the future of the old Pwll Community Centre. Hengoed ward councillors of Carmarthenshire County Council and Llanelli Rural Council provided the public with an update on imminent changes to the tenancy of the old Pwll Community Centre. The centre, which is currently used by Carmarthenshire County Council Education department, will soon be vacant as they look to relocate the current provision at Pwll to Burry Port. 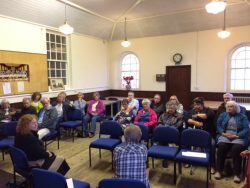 County Councillor for Hengoed, Penny Edwards called for the meeting, with the help of Pwll Action Committee, in order to see if there was appetite within the Pwll community to retain the building for community use. This was confirmed by those in attendance at the public meeting who moved that a declaration of interest be lodged with the land owner, Carmarthenshire County Council. Llanelli Rural Council members confirmed that they would consider the transfer of the building over in to their responsibility from Carmarthenshire County Council on the basis that the centre was to be used for community purposes. However they reminded the public that Carmarthenshire County Council have yet to confirm whether it is available under their Community Asset Transfer programme and the next step is to find out its availability.